Since 1996 Nicks Forza Ferrari has been offering some of the finest custom valves & valve guides in the business for Ferrari's. We can custom make valves & valve guides for your specific application. ​SINCE 1996 Nicks Forza Ferrari has been offering some of the finest custom valves & valve guides in the business for Ferrari's. We can custom make valves & valve guides for your specific application. 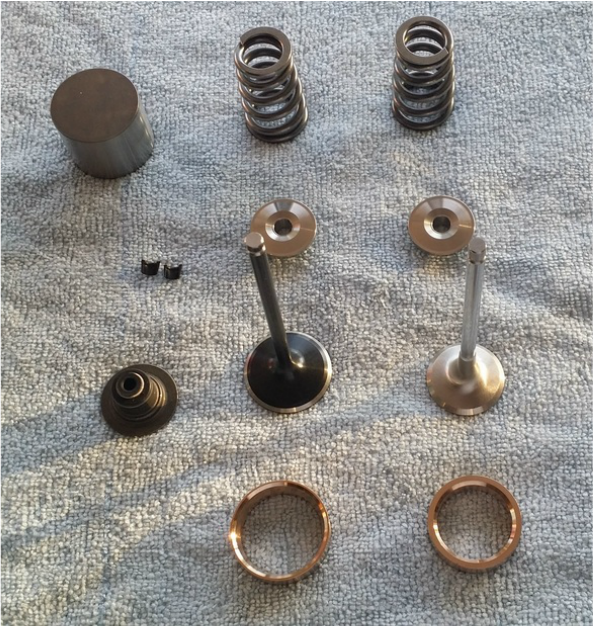 In the photo on the left, the copper colored valve guide on the far left is the original guide used in the early 355's and is made of a copper alloy material. This is a soft material that causes the guide to wear quickly and fail prematurely. The guide in the center is made of iron and came standard in the head that Ferrari used in the later 355s and 360s and also when they had to replace heads with failed copper alloy guides. The iron guides seem to hold up better than the soft copper alloy material used. Notice, however, how it is straight with no flange. This could allow the guide to "walk" down into the heads and cause severe damage, especially if an engine were to overheat. On the far right is a PROVEN manganese - bronze guide used to replace the original flanged guide. We have been using these valve guides since the 1996 in our 308/328 engines with ZERO comebacks. We stock Ferrari valve guideds and seals for most Ferrari models. Prices starting at $ 19.95 per valve guide.